Cats tend to be naturally inquisitive creatures, so when I took an interest in container gardening, I didn’t think much of my cat sniffing around… until she started eating the plants themselves. After a few close calls and numerous google searches I cleared all the toxic plants out of the apartment, but when she started pawing at my salads it got me thinking that perhaps she needed some greenery in her diet. I started with a small, inexpensive kit of cat grass from the local pet store just to see if she’d take to it. Once the grass started growing it was a smashing success. She loved it and it distracted her from some of the other cat-friendly plants growing in the household, allowing them a chance to recover from her frequent nibbling. All good grass must wilt, however, and it soon came time to replant more. The pet stores do have refills, but the plastic containers and the soil from the potting wafers didn’t withstand too many repeated plantings. I was able to find some oat, wheat, rye, and barley seed packets at a fraction of the cost online. Buying the seeds outright allowed me a lot of leeway in terms of how much and where I could plant. I tried large and small terra-cotta containers and even used a long window planter over the winter months. She particularly enjoyed the window planter because she could eat infinitely more grass than before as well as lounge in it, bringing a tad of the outdoors in during those cold, white winter months. My cat and houseplants seemed happier and healthier with this arrangement so I thought there must be something to it. While definitive research is hard to find, many experts provide ample reasoning for why some cats are attracted to vegetation. The grasses contain folic acid which is a necessary nutrient for promoting the production of hemoglobin. A little extra folic acid in a cat’s diet can increase hemoglobin production which in turn helps oxygen move through the bloodstream. You might find your cat has a little extra pep after adding grass to the diet. For cats that hunt and eat their prey, munching on some grass can provide relief of indigestion and even act as a laxative, helping them expel the indigestible parts. 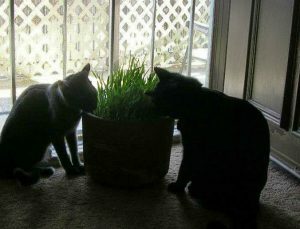 It’s very easy to start your own cat grass planting. Simply choose a shallow bowl, dish, planter, etc that suits your space. While you can certainly use a deeper pot, you don’t need more than a few inches of soil to grow the grasses as their roots don’t go too deep. Scatter the seeds on the soil and cover with another 1/4” of soil or so. 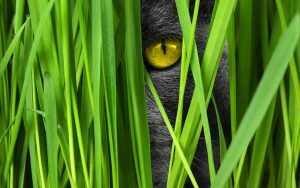 The biggest trick to successfully maintaining the cat grass is watering. What works well is to place a layer of paper towels over the seeds and spritzt it daily, keeping the towels moist. Within a few days to a week you should see some grass popping up. 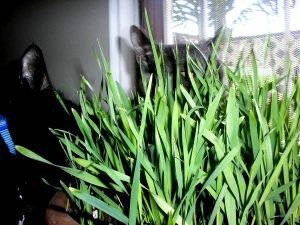 If you water your cat grass once a day so the soil stays moist, it will grow more quickly and wilt slower… if the kitties don’t mow it down first!